CO2: Second Chance revises and enriches of the original competitive game CO2 published in 2012 and also includes a brand-new cooperative game, in which the players have to collaborate to save the world, losing victory points each turn that they don't achieve their goals. The new cooperative mode challenges the group with numerous, small ecological goals, which do an excellent job of easing new players into the strategy of the game, by helping them focus on smaller tasks that build toward the larger endgame goals. You and your friends can really apply your best lateral thinking to address the short-term and long-term objectives; however, each player also has a secret goal they must achieve in order for the group to win the game, which keeps things cooperative, without allowing one “alpha” player to dictate other players’ turns. If you have played the 2012 release of CO₂, you will be pleasantly surprised by this new cooperative game. It uses the same core rules, but with just a few twists and tweaks in just the right places, it provides a really fresh experience. If you have never played CO₂, the cooperative game can help you train to play CO₂: Second Chance competitively; however, the co-op mode is not merely a stepping stone: You could play the cooperative game for years to come, and every play will present new challenges! This new and totally re-designed edition of CO2 will bring completely new iconography, an entirely new rulebook (with lots of 3D pictures for easier comprehension of the rules), more balanced gameplay, a new events deck, improved and streamlined mechanisms, a shorter length of play and upgraded wood components for the power plants (instead of cardboard tokens), while maintaining beautiful illustrations on the board and cover. 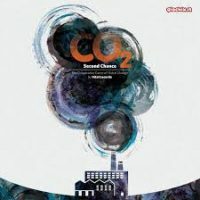 Add a Review for "CO₂: Second Chance"